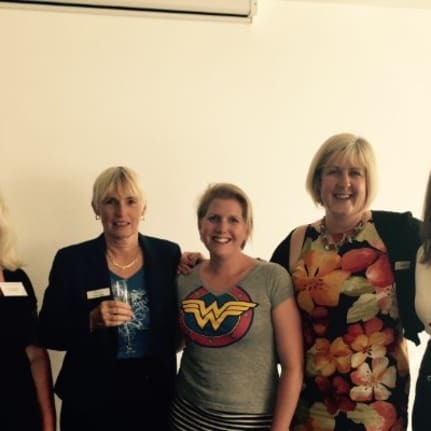 On Monday evening, Shaw Gibbs welcomed over 60 ladies from the Oxfordshire business elite. Solicitors, finance professionals and marketers – to name a few –gathered to hear the works of renowned author, Clare Mackintosh. Clare discussed a range of topics, however, the main focus was her transition from high-ranking police officer to successful author, or ‘going from crime fighter to crime writer’ – as she neatly quipped. Clare first established herself in the literary community with the Sunday Times bestseller and Richard & Judy book club winner, I Let You Go. Following the success of her first novel, Clare has returned this month with her hotly anticipated second title, I See You. A raffle prize of a signed copy of Clare’s latest work caused just as much anticipation amongst our guests, with the eventual winner taking home a copy of I See You a whole three weeks before publication. Listening to Clare talk about some of the challenges of being a novelist reminded me of some of the special issues we see as accountants and tax advisers when dealing with authors and publishers. Consequently, I thought I would share some thoughts on authors and publishers – today’s focus being authors. In accounting and tax terms being a novelist is a trade. All the basic rules for preparing accounts for a trading business - and for the taxation of that business - apply to authors, just the same as plumbers and management consultants. There are, however, some additional special rules and some types of expenses which are particular to authors. Many authors struggle to earn enough to support themselves without other sources of income, but at the successful end of the earning spectrum there are significant amounts of money. The most famous example of this meteoric rise is, JK Rowling, who in a few short years progressed from writing in a cafe in Edinburgh to completing the final part of the Harry Potter series of books in a suite at The Balmoral, protected from the paparazzi. A novelist’s income can come from many sources – some more glamorous than others – however, the main sources are royalties and advances (of royalties). Advances can be significant sums of money - reaching tens or hundreds of thousands of pounds, and are expected to keep an author going through the final stages of completion of their work. Income is consequently lumpy and intermittent and could lead to inequitable payment of tax at higher rates. There are special HMRC rules which allow authors to average income over two years where the income in the poorer year is less than 75% of the better year. These rules apply only to sole traders, but in a limited company application of normal accounting rules, will allow for the deferral of income across the expected project of the book and in this way the taxation of the income is also smoothed. Whether trading as a sole trader or limited company the rules for deductible expenses are the same. Any expense has to be for the purpose of the trade and will include many specific to writing. Typical examples include; agents fees, editorial, marketing, subscriptions, costs of the process of any self-publishing, use of home as office and of course professional fees of lawyers and accountants. Another big consideration for authors, amongst other professions, is of course VAT and they must register VAT using the current thresholds (£81,000 pa). A sole trader has to remember to include other sources of income when reviewing the thresholds. The Flat Rate Scheme for VAT can be used for businesses with a turnover of under £150,000 thus simplifying the process. VAT is a complicated area and professional advice should be sought when there are any cross border issues or supplies of digital services to consumers. The move to self-publishing and e-books has significantly complicated VAT for professional writers. A self-employed writer in the early stages of their career may be able to set losses incurred in the writing trade against other forms of taxable income in the year. The author must be confident that they can prove to HMRC if challenged that the trade is being carried on in a proper commercial manner and with the full intention to make a profit in due course. Otherwise there is the risk that HMRC would argue it is merely a hobby and that no losses can be offset. Many authors decide to trade via a limited company. This offers corporate protection and also potentially lower rates of taxation. Corporation tax is currently 20% and due to fall to 17% and possibly 15% in the post Brexit climate. Once the company has paid its corporation tax the author can withdraw funds as dividends or salaries and have them taxed at the appropriate rates. Generally companies are more appropriate where the income figures involved are larger. Changes to the rules regarding taxation of dividends which came into effect in April 2016 have eaten away at the tax advantages of trading through a limited company. I met recently with an author who was in the final stages of completion of his first book. He was lucky enough to be in receipt of royalty advances amounting to over £300,000 from the UK, US and a number of European countries. After discussion of his plans and other personal circumstances he decided to move forward as a sole trader. This will always be a personal decision and we would always advise meeting a professional to discuss. For those authors who make the big time there are all the problems of success. How should I control the timing of tax payments and the amounts involved? What considerations should I make in regards to long-term issues such as IHT? More excitingly, how should I invest all these hard earned profits? All professional writers, whatever their degree of success, should understand how their income is accounted for and taxed. A very good starting place for anyone new to the field is The Writers' and Artists' Yearbook 2016. At Shaw Gibbs we are always happy to talk to professional writers and others involved in any aspect of the book trade but do run the risk of getting sidetracked into discussing writing and literature in general!